Back in February the KAMERS team was invited to visit Redhill Pottery in Scarborough, the “Deep South,” as owner Bruce Bell calls it. For our 2012 product viewings Bruce drove all the way to Stellenbosch with his pottery on his motorcycle! So we owed him one and went on a road trip along the sea through Muizenberg, stopping at Olympia Cafe in Kalk Bay for great coffee and to indulge in delicious pastries, over the back of Table Mountain, to Redhill, tucked away among the trees behind the mountain. Eight years ago Bruce bought Redhill Pottery and become the third owner. “I like to think that in a business like this you don’t sell it, but pass on this living thing to be nurtured by someone else,” Bruce fondly told us while introducing the studio. “I think buying the pottery was my midlife crisis! I had been in corporate for 18 years and in hindsight I was burnt out. I wanted a change, I wanted to spend more time with my family, and the chance to use some of the creative skills that I had learnt at University.” Colourful and peaceful, Redhill provided just that. After meeting his wife, Pauline, and Jason and Glenda, who are brother and sister and have been on the Redhill team close to 20 years, it was time to visit the shop, where their hard teamwork is proudly displayed. Their classic enamel look is their signature range. “Many have tried to copy it, but very few, if any, have successfully succeeded. This range is timeless and shows the honesty of our values and ideas,” Bruce shares. Redhill Pottery is also known for their love of strong colours. “The bright sunshine, those incredible colours that you see in nature which are impossible to reproduce – they are reflected in our work,” says Bruce. Solid timeless forms reflect their character as down to earth, reliable and easy to get along with. Their wares are durable enough for daily use and good long term value. Bruce would like Redhill to stay small and personal, but naturally this makes it challenging to make a living. We were glad to be able to offer some tips and advice on what designs, colours and styling would work at KAMERS and delighted at our recent product viewings to see Bruce took it to heart. (Thankfully this time Bruce didn’t load everything on his motorcycle!) “The warmth, encouragement, ideas and feeling part of the KAMERS family is a continual inspiration for us. I love visiting the KAMERS studio,” Bruce told us. “Being situated in the very Deep South, we are very fortunate to have the inspiration of nature all around us. Generally people here are pretty laid back and creative, in a very broad way,” Bruce replied when we asked how they stay inspired. After being treated to delicious sushi and champagne, it was time to hit the road back to Stellenbosch. Our trip to the “Deep South” left us refreshed and content, knowing that KAMERS is still making a difference to many small businesses like Redhill Pottery. Redhill Pottery will be at KAMERS 2013 in Bloemfontein 3-6 October, Stellenbosch 5-10 November and Irene, Pretoria 3-8 December. Get their beautiful and very afordable goblet bowls and stippled bowls in the KAMERS Online Store. 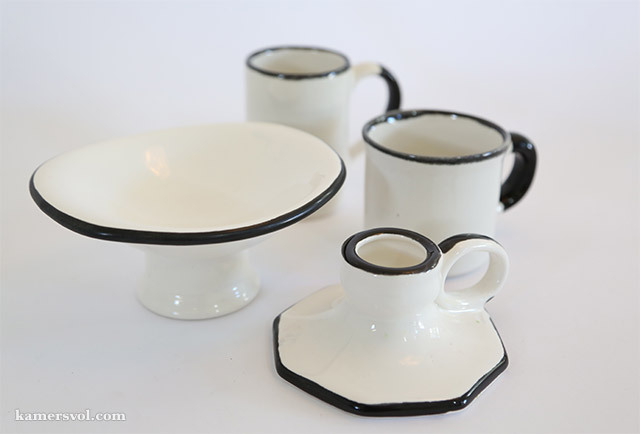 We especially love these timeless items from their white classic enamel-style range, which will be at KAMERS 2013. Tags: Bruce Bell, enamel, Kalk Bay, KAMERS 2013, Muizenberg, Olympia Cafe, Redhill Pottery, Stellenbosch. Bookmark the permalink.